One of the main sound design challenges in the Glider game was to create reactive wind ambiences, distinctive to each environment. As the game was in VR, it was especially important for the player to feel as though they were really flying through the air, just behind the glider. To create this sense of realism, Lab Grown Music collaborated with Opposable VR's programmers to implement responsive ambiences that adapt to the speed and yaw of the glider. The game also includes plenty of satisfying sound effects such as when the player flies through a cloud ring or picks up a floating bonus. Lab Grown Music had the pleasure of working with Bristol based Opposable VR on Cartoon Network's BAFTA nominated Adventure Time virtual reality game "I See Ooo". The game was released for Google Cardboard and aimed at younger players. The player takes the role of Finn the Human, and starts the game enjoying a party in the Treefort. 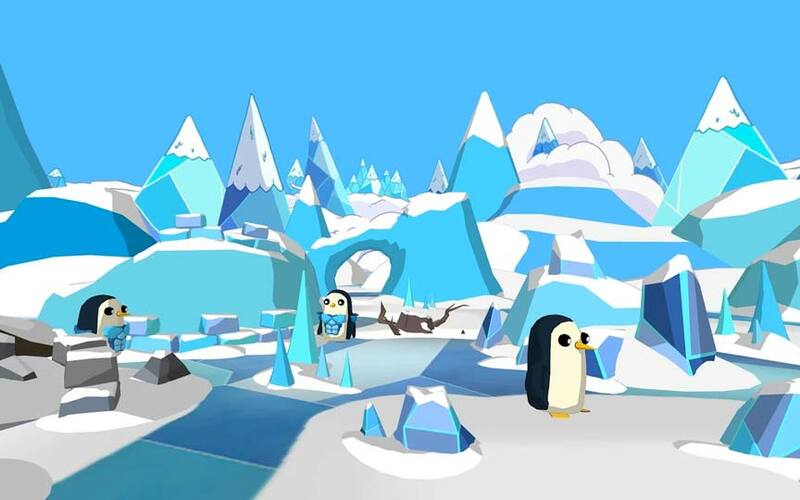 When Ice King turns up and ruins the party, Finn has to complete mini-games to find and unlock other well-known characters like Jake, Princess Bubblegum and Party Pat. Upon game launch, and the introductory Treefort party, the player begins the game experiencing a VR comic accompanied by an audio cinematic. Afterwards, the Treefort sound design features ambiences for 3 different rooms including the Treasure room and the Weapons room. They all sound a little lonely due to Ice King's party sabotage at the beginning of the game; however, being surrounded by the creaking branches and hearing the wind whistle through the knots in the treehouse is a relaxing experience for the player whilst they interact with the user interfaces. The Puzzle Path game is set in 3 different zones of the Fire Kingdom and the sound design was particularly enjoyable to create. The player is surrounded by desolate landscapes, crumbling piles of rocks and cavernous lava pools, so there was lots of scope to have fun with reverberant bubbling and plopping sounds, punctuated by occasional rockslides and jets of fire. Throughout the rest of the game, sound design includes lots of fun 8bit sounds, guitar licks and carefully selected character dialogue to reward the player.